Most of the shooting world understand and agree that our Armed forces do an extraordinary job in carrying out the tasks they are required to do with utter professionalism and courage. Whether we agree or not with the motivations or decisions to engage our forces in all manner of tasks, including the decision to engage in armed conflict, we can agree on the bravery and resolute determination of our Army, Navy and Air force to carry that mission through. We rely on our forces to protect us, to protect our national interests, to support oppressed populations and to rescue us at home during crisis. We ask them to put their lives on the line and their families through constant concern and in return they expect so little back in comparison. We all know of the excellent work both in terms of funding raising and raising the profile of injured service people that Help for Heroes has done since 2007. They and the people they help have become part of our national psyche. Help for Heroes has forced the cost of service inflicted on some of our service people, from the shadows to the front row and celebrated it! In our own small way, Hampshire Sporting Shooter have been supporting a program that is part of Help for Heroes, Shooting for Heroes. The Shooting for Heroes program started in 2014 and was based at Tedworth House and offered to those within the Band of Brothers. The simple idea was to develop Help for Heroes chaps understanding and knowledge of Shooting as a sport in all its guises. Those participating learn an overview of everything from gun making and engraving to countryside management, loading, DSC qualifications, keepering, game preparation and shoot management, over the course of a year. 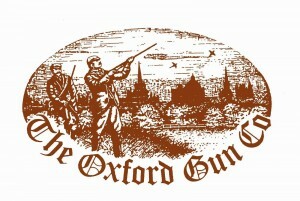 Throughout that year the chaps are also encouraged to take part in regular Clay shooting. This in turn equips participants with the necessary skills in shooting a shotgun safely and to a decent standard, all the while coaching on shooting etiquette, tradition and standards. The skills learnt here are then put to the test in two of the year’s highlights. The chaps take part in a duck shoot and a spectacular end of course driven shoot, kindly donated by some of the South’s finest sporting estates with the next year’s intake in the beating line. In January this year I was privileged to be invited to join the Chaps at the Stockton Estate for just such a season finale, just outside Salisbury for what was one of the greatest shooting days of my life. I have never seen such camaraderie in the line, such brutal yet non combative goading in the gun bus and such a mix of social circumstance on every peg. You simply can’t replicate that at any commercial shoot and it’s a wonder to behold. The camaraderie, fellowship, moral boost and shared experience are as much a part of the course as the vocational opportunities. For some it is simply the experience of being back amongst those with a shared experience and for others, a true opportunity to get networking, qualified and involved in the sport as a potential career. As many of you may have tweaked, I have no hands and haven’t had since I was born. I have never confirmed or denied that I am bothered either way about my missing appendages but have tried never to be pigeon holed as a guy with a disability/ deficiency. That said, some of my experiences from dealings with a tiny minority on shoots and from wider areas of the shooting community led me to decide that enough was enough and it was time to change people’s perceptions and make shooting as comfortable and accessible as it can be, to everyone who wants to be involved no matter their gender, race or perceived disability. Shooting for Heroes encompasses all of those values in one program. If you are deemed able to shoot safely, then nothing else will stand in your way. Shooting for Heroes encapsulates everything good and worthy in our sport and promotes that to the wider community. It brings those that may not be able to gain understanding from the wider community about their experiences together and demonstrates how just being out amongst nature, having a much greater depth of understanding of what you eat and continuing to have positive shared experience, can make such a difference in the lives of those that we owe a great thanks and national duty of care to. I was honoured to receive a simple Certificate of Outstanding Achievement and letter of thanks from Help for Heroes in thanks for my small contribution to the Shooting for Heroes program. I was genuinely moved to have received this valued accolade but at the same time, feel that I should be thanking them. If it wasn’t for my having met the Chaps and heard some of the life changing experiences they’ve had to go through, I would never have realised the extent of what Shooting for Heroes achieves in getting them out! Not all the members have been injured in conflict, but all have been injured whilst in service to their country either physically, mentally or both. These guys have all had to rebuild their lives and come to terms with a new set of circumstances whilst dealing with the pain both mental and physical of the trauma that bought them to Help for Heroes in the first place. Will and I are delighted to continue supporting and promoting not only a great cause and something that our sport be offering every opportunity to, but also the chaps within the Shooting for Heroes program, in as many ways as we can. Shooting for Heroes brings out the best in our sport both in terms of what the Shooting industry can offer those rebuilding their lives and in promoting the sport across it’s sub genres. Through Shooting for Heroes we can unite as one voice and promote the benefits of shooting in the ways we have all been talking about for years yet found it so hard to get a voice of decent in the non shooting world, proving their preconceptions wrong. Shooting for Heroes provides a classless, sexless, raceless opportunity to all supported by Help for Heroes and yet an amazing, vibrant, hilarious experience in keeping with shootings traditions and should be considered a beacon of how the rest of us can move those inclusive aspirations on to our gun and beating lines. 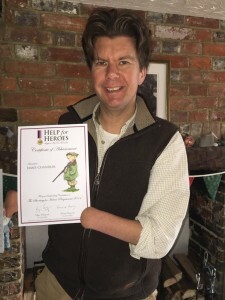 Hampshire Sporting Shooter will continue to support Shooting for Heroes in any way we can and would urge anyone interested in shooting to do the same. 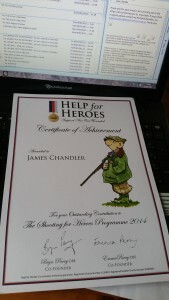 Please visit the Help for Heroes website or indeed contact us, to find out how you can do the same.